It only took them two years to go from 90% to public alpha. The excitement for a new version has been tremendous and today we’re finally able to repay the much appreciated loyalty and moral support from the community by releasing the first public alpha: TextMate 2.0 alpha (r8930). I’m happy that they managed to make it. I’m happy for all TextMate fans, of which I count myself one of. TextMate was was the editor that convinced me I could work sans IDE. It had perfect balance of functionality, flexibility, and raw power to get things done. Any language I wanted to write in there was a bundle for it. There were extensions. TextMate was a Swiss Army knife that I could customize and tweak until it was just perfect. Such perfection wasn’t meant to last however. Things get rocky when you did multi-file searching. Find in general was particularly fragile with larger files or extended regex. Regex was used for syntax highlighting and could trap itself in a recursive parse, crashing the application. General usage was fine, but the edge cases where there that made it an unstable application. 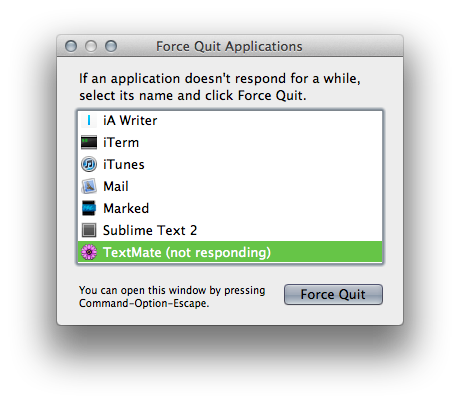 I wish the best for TextMate, but I parted ways with it several months ago. A quick look around the alpha makes me glad I switched. Maybe I’ll use it for a few days.